In a recent article published in Chelonian Conservation and Biology, researchers race to study a newly discovered mud turtle before it becomes extinct. Despite the Vallarta mud turtle’s recent identification, it’s already at risk of extinction. Researchers have found only one female Vallarta mud turtle, and only five of the turtles have been seen since 2013. Chelonian Conservation and Biology – Amid threats of extinction, researchers worldwide are racing to discover and protect some of the world’s most endangered species – turtles. A recent article published in Chelonian Conservation and Biology reports the discovery of a new mud turtle species in Mexico. Research suggests that these turtles could be among the world’s most threatened freshwater species, meaning urgent conservation programs are essential. Until recently, only two species of Kinosternon mud turtles were known to live in the central Pacific lowlands of Mexico, and only 12 species had been recorded in the country. Based on physical differences and color patterns, researchers have identified a new species in a small area of western Mexico. Named after famed freshwater turtle researcher professor Richard Carl Vogt, the new species has been given the scientific name Kinosternon vogti and the common name Vallarta mud turtle. The researchers found that Vallarta mud turtles differ from similar turtles in their small body size and distinctive shell features. They also report that males have a large, yellow, rounded nose that makes for a striking appearance compared to other mud turtles. The turtles prefer small freshwater streams and ponds in the Puerto Vallarta area and are believed to live in these water sources permanently. Despite the Vallarta mud turtle’s recent identification, it’s already at risk of extinction. Researchers have found only one female Vallarta mud turtle, and only five of the turtles have been seen since 2013. The researchers blame urban growth for destroying the species’ habitat; dead turtles have been found along busy streets around concrete canals and shopping malls that now cover areas the turtles originally called home. Globally, rainforest species have been disappearing at such a rapid pace that we are in a period known as the “sixth extinction wave.” Deforestation, urban growth and other human activities are eliminating native species at growing rates. Researchers continue to study how urban growth affects local animal populations, particularly newly identified ones. As species continue to disappear before they can be studied, scientists rush to learn more about the interactions of humans and turtles in formerly rural and increasingly urban communities. The researchers concluded that the Vallarta mud turtle should be considered endangered according to Mexico’s national risk assessment guidelines. Viable populations of the species need to be found and protected; otherwise, they could disappear right on the heels of their discovery. Full text of the article “A Distinctive New Species of Mud Turtle from Western México,” Chelonian Conservation and Biology, Vol. 17, No. 1, 2018, is now available at http://www.chelonianjournals.org/doi/abs/10.2744/CCB-1292.1. Chelonian Conservation and Biology is an international scientific journal of turtle and tortoise research. Its objective is to share any aspects of research on turtles and tortoises. 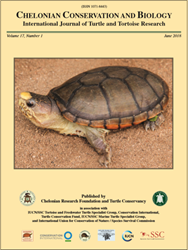 Of special interest are articles dealing with conservation biology, systematic relationships, chelonian diversity, geographic distribution, natural history, ecology, reproduction, morphology and natural variation, population status, husbandry, community conservation initiatives, and human exploitation or conservation management issues. For more information, please visit http://www.chelonian.org/ccb/.